Gangsters Out Blog: Surrey RCMP investigating voter fraud. Not. CBC is reporting that "Surrey's chief election officer says he has "sufficient cause to suspect illegal activity" around the mail ballot process in the leadup to the Oct. 20 municipal election. Anthony Capuccinello Iraci confirmed the RCMP is investigating allegations of voter fraud, but said it was too early in the voting process for any harm to have been done." Investigated by the RCMP. Yeah right. Like that's not a conflict of interest. The RCMP aren't going to charge Tom Gill because they want him to win since Doug McCallum will be getting rid of he RCMP. Having the RCMP investigate the mater is a complete conflict of interest. They won't charge Tom Gill any more than they charged Christy Clark in BC Rail. As soon as the BC Liberals renewed the RCMP contract the money laundering charges were dropped. So the voter fraud was within the South Asian community and it wasn't Rajesh. Gee, I wonder who that leaves. On that note, Jas Rehal is a d*ck. 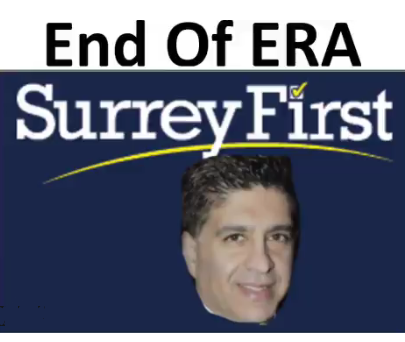 The Surrey Now Leader is reporting that "Surrey removing 200 election signs near intersections that violate city rules. In Surrey, signs aren’t allowed within 25 meters of intersections." 25 meters of intersections? That is f*cking ridiculous. People have always out election sign at intersections because that is where traffic stop to wait for lights. Jas Rehal is that baby peacock killing wannabe mall cop. Fire him. BTW I want to press charges for theft. He stole my sign on 88th and King George Hwy and I was not notified.